One in five Americans will develop skin cancer in their lifetime. That makes skin cancer the most common form of cancer in the United States. Nearly 13,000 people die from skin cancer in America every year. Melanoma, the deadliest form of skin cancer, will claim an estimated 10,000 lives this year. Not only is skin cancer the most prevalent form of cancer, but it is also one of the most easily prevented cancers. In most cases, melanoma is caused by unprotected exposure to ultraviolet (UV) light. The sun’s rays are comprised of UV light, but indoor tanning lamps and tanning beds also emit UV radiation. Simply protecting your skin from UV light can reduce your chances of developing skin cancer. • As much as possible, stay indoors during the sun’s peak hours (10am to 4pm). If you are outdoors, seek shade under an umbrella, tree, or another shelter. • Use a broad-spectrum UV protection sunscreen with an SPF of at least 30. 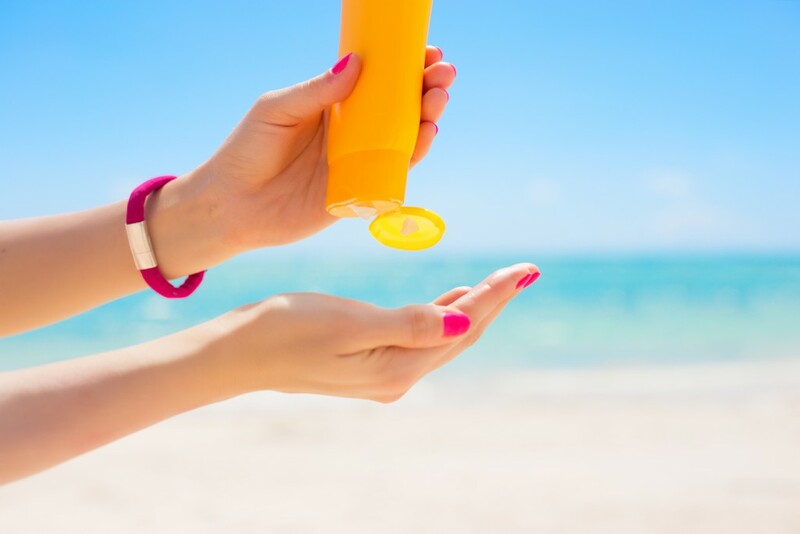 Be generous when applying sunscreen and reapply every two hours or more often if you are swimming or sweating. • Wear protective clothing (long-sleeved shirts, long pants or skirts) when you are in the sun, including a wide-brimmed hat. You can even purchase clothing with UPF (ultraviolet protection factor)—look for UPF up to 40 or 50. • Wear sunglasses that block 100 percent of UVA and UVB light. • Before putting on makeup, apply sunscreen or moisturizer with an SPF. Some cosmetic products—such as makeup and lip balm—may have an SPF as well. • Skip the tanning bed and opt for sunless tanning lotions or spray tans instead. • Get regular skin cancer screenings from your dermatologist. It’s important to know your skin and to regularly check it for any abnormalities. For a thorough check, ask a spouse or another loved one to help you check your skin—and return the favor. • A is for Asymmetry: One half of a mole or birthmark does not match the other. • B is for Border: The edges are irregular, ragged, notched or blurred. • C is for Color: The color is not the same all over and may include shades of brown or black, or sometimes with patches of pink, red, white or blue. • D is for Diameter: The spot is larger than six millimeters across (about one-quarter inch—the size of a pencil eraser), although melanomas can sometimes be smaller than this. • E is for Evolving: The mole is changing in size, shape or color. Melanoma isn’t the only kind of skin cancer. Basal cell carcinoma and Squamous cell carcinoma are two other types of skin cancer that are most often found in areas that get a lot of sun exposure. If you notice any of these symptoms, schedule an appointment with your doctor. It’s always better to be safe than sorry!